So I'm making the leap away from the iPad sandbox. I'm tying to figure out what I need in terms of audio interface. Below is the list of gear I've accumulated. Note: I'm not really interested in recording a live band. Not interested in playing live, either. I just need to reliably get iOS creations into a DAW. NOTE: This is a reup since I unintentionally hijacked another thread; apologies to @johnnyglass for that. I just need to reliably get iOS creations into a DAW. This can also be done by rendering the audio on iOS and importing the WAV. If you want to use the iPad as a realtime sound module I'd say try if IDAM (https://forum.audiob.us/discussion/23240/idam-got-a-fix) works for you. I'm using an (https://www.iconnectivity.com) iConnectAudio4+ myself (https://forum.audiob.us/discussion/comment/478083/#Comment_478083). I'd definitely try IDAM and/or studiomux first to see if you can take the iPad out of the equation, in terms of wanting a USB input into an external audio device as opposed to the laptop itself.... that said, how many available USB ports on the MacBook Air do you have? Looks like the iRig also needs a USB port. Would maybe either the iConnectAudio4+ or the Arturia AudioFuse work for you? The MacBook Air has 2 USB ports so a hub is needed if all controllers need to be used. Use IDAM for iPad Audio -> Mac Book Air. An interface with multiple inputs is needed to cover recording Bass/Guitar, Mic and Line-In without patching if everything needs to be recorded at once. A mixer could also be handy for connecting the Digitakt and the Turntable. I'm happy with my Steinberg UR-242 and the Korg nanoKEY as a controller. Wow, I had ignored all those IDAM threads previously. That's pretty fascinating. I guess all I really want is for the iPad and the Digitakt to be sending audio and/or midi to Logic at the same time. Everything else can be tracked later. And the Duet looks amazing, but why so $$$? @ExAsperis99 the Duet is a (very) high quality audio device and Apogee doesn't mess with Windoze, still sticking to their Mac tradition. Smaller market volume, but they earned a lot of reputation in pro audio. The mic preamps provide 75dB of gain. You may listen to @flo26 's records as a reference. He (mostly) uses the Quartet interface, which is basically a double Duet. Also, I cut my teeth first on post-punk and then indie rock, so I definitely have a higher tolerance for noise than most audiophiles. I'm thinking the iConnect 2+ looks good, or possibly a Scarlett interfact. @nazim13 what do you mean by "desktop interface"? I have a Scarlett 6i6 2nd gen (I wanted spdif... rarely record real stuff through it) - I've had it 2 days. It's great! The low latency is very nice. The "6" is the spdif over the 4i4. I do miss the ability to do internal loopback, but that's a tiny thing. It's got a wall wart, so isn't bus-powered. That's something to check on what you get - fortunately, a lot of those with only a couple in/out can be bus-powered. Thanks for your advice, @samu. Don't have Logic installed yet, but I tried the iPad via IDAM into GarageBand, but I don't seem to be able to choose a midi instrument? Does this not work with GB, or have I not set things up correctly? I'm pretty happy with the Ica4+. IDAM 'midi' requires iOS11 on the iOS device. (Just out of curiosity what iOS & macOS version are you running?). When you enable the iOS device in the Audio & Midi setup it becomes a class compliant Audio-In and Midi In&Out device and works with every app you've got running on your Mac. Pretty sure I have the latest OS on both laptop and iPad. I'm sure I did something wrong in the Settings. The iPad seemed to register with the computer — I received a core midi message that said as much — but in Garageband's instrument list, there were only the built-in instruments. I watched a tutorial with a guy using Logic, which allows you to add a New Midi Track, an option not available in GB. 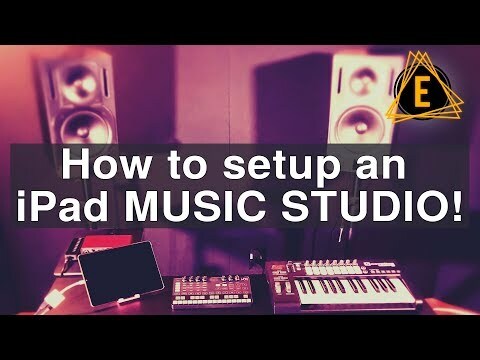 This just was posted on Discchord, which I found very helpful. I also love the idea that there's an Australian so into ice hockey. Very small sample size, but he seems to adore a Steinberg similar to the one used by @samu. That seems a good way to go. I just want to make sure that I can send my iPad synths into Logic. Someday, when Overbridge comes to the Digitakt and I can send the DT's stems into the laptop rather than just recordingin a stereo mix, I may have to rethink the interface. But it seems that Elektron users have been waiting for this for ages, so I'm not holding my breath. It's a little expensive ($300) and I wondered; could I not get away with a smaller interface plus a powered USB hub? I'd like to run the iPad and a Digitakt into a Macbook. Not sure if I'd use the Digitakt to sequence iPad synths (which I have done, but I don't have a fluid workflow yet). I'm asking again because it's around my birthday and, you know, I deserve it. But I'd also rather not spend $300 if I can get away with $100. Dean ( @Junebug ) did a great video about setting up an iPad studio; in it he relies on a USB hub.